I need input as to participants. PM, please. CLASS I: Any year 2000 or newer sports car body (any material), stock Carrera GO!! !/SCX chassis, any magnet in stock location with no modification of the hole, stock crown gear (pinions open) and any motor (inductors may be removed and chassis modified to fit the body). Tires inside the fenders. Carrera GO!! !/SCX wheels only, but interchangeable from any GO!! !/SCX car. Stock guide pin/guide only. Tires are open to compound. CLASS II: F1 Carrera GO!!! or SCX: Same chassis rules (except no mods to F1 Chassis) and all rules as above but only stock F1 Carrera GO!!! or SCX wheels. Any tire compound. F1 bodies must be Carrera GO!!! or SCX. TRACK: 20 laps each lane of the 67' road course, at 16V, up to 5 Amps available. Longest straight is 14' so Carrera/SCX gearing is about perfect. Practice will be 10 laps per lane prior to race. Winner determined by fastest laps in each lane averaged. Prizes & Sponsors : Ranch-Design: Surprise Prizes & Slotronics: SCX Tuner Cars. SCX themselves have contributed tons of F1's to go to each entrant! Also, an anonymous corporation is giving $10 (US) to each class winner. Last edited by cjent; 06-24-2008, 01:32 PM. Copied and stuck here in 1/43rd Forum. Good Luck with this race. I hope you get a good turn out of GO and SCX 1/43 Racers. Thanks for organizing a 1/43 Scale Proxy Race. 3 countrys are represented here and more on the way for the 20-22 June proxy. Last edited by cjent; 08-07-2008, 04:52 PM. Close races and congrats to all! Mike's stock motored Carrera Vette #6 is quick, as you can see. Amazing. Faster than last year! You'll be getting hate mail, Mike. In F1 the guys with boxer or 6V Carreras were about .5 to .8 seconds faster. They decided to replace their chassis with stock Carreras to make the race more competitive, so all cars in F1 were factory stock. 2 of them still got on the podium! The SCX Ferrari of Dave was right in the hunt. Last edited by cjent; 06-23-2008, 02:01 PM. Class 1- Mike #6 Vette 1st, Jodi's #48 Mosler 2d & Mike's #3 Vette 3d. 24 SCX F1's, 3 Buses by Farmnurd (Dave) and a Polyfect Ferrari F50 & 2 car kits by Mark (Squatch), a set of poly SCX Tires for each winner by Ranch Design (Sticky!) and $10 to each winner by CJ Enterprises/1st Capital Investments (Capn Jodi & Friends). Each entering team gets 1 SCX F1. The winner of each class gets a 2d SCX F1, $10, a set of Ranch Design tires, & a bus. The winner of Class 1 gets the Porsche Super Slick. The winner of Class 2 gets the Ferrari F50 Polyfect. NOW, the 2d and 3rd place finishers in each class get another SCX F1! Here are the winners of Best Looking car in each class, who get an additional F1! Class 1 is Jimmy's Ferrari & Class 2 is JXR's Red Bull F1 selected by the Staff at HPR. And best overall time for the Proxy, Mike in Sports Car, gets the Ferrari F40 kit. Whew! Now to get it all shipped NLT Thursday morning. Without mistakes. Last edited by cjent; 08-07-2008, 04:53 PM. Top Notch job on the Proxy, CJ! A professional but downhome approach. Fun and fast! What 1/43rd slotcars are all about! Kudos to SCX for all the F1 Compact prizes! C.E. Thanks! Great field of cars and participants. 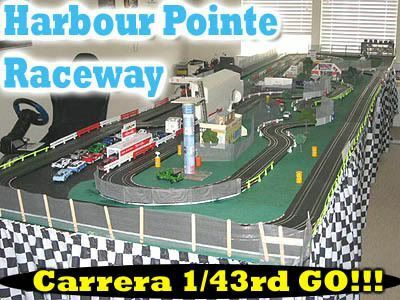 Cjent1 Racing and the gang at HPR are to be commended on making a weekend of fun available to the 1/43rd hobby and racing community! Last edited by cjent; 05-15-2009, 11:21 AM.